The JR Iditarod mushers have arrived at Yentna Station, the half-way checkpoint. The eleven mushers arrived within 65 minutes of each other. Translate that into out times with the 10-hour required rest and the differential and the teams will all depart between 05:28 and 06:34. Grace Nolan edged Colby Spears into the checkpoint by only a few seconds. With her start differential, she’ll be the first to depart the checkpoint at 05:28. Spears will follow at 05:30. One Minute later, Bailey Schaeffer will take to the trail. Chandler Wappett will be eligible to depart at 5:33 followed by Emma Shawcroft at 05:37 and Anna Stephan at 05:44. Rookie musher Talia Martens will depart at 05:59. 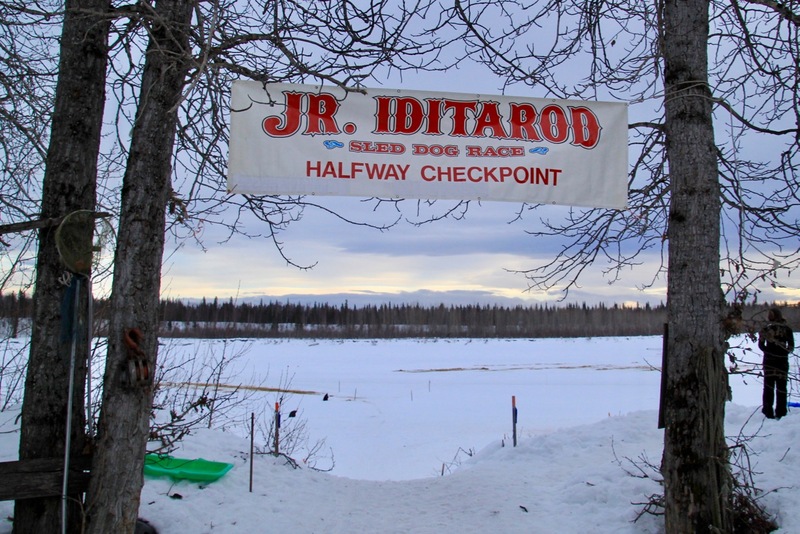 The final four mushers to leave the checkpoint are all rookies. Charmayne Morrison can take the trail at 06:10, Christina Gibson at 06:16, Mikah Whitehead at 06:24 followed by Lara Renner at 6:43. Calling this a tight race would be an understatement. With clear skies tonight and cold temperatures the trails will set up after today’s traffic and promise to be faster for the inbound leg of the race. Run times and average speeds showed that the trail was slower which was expected. After parking amongst the trees, the mushers made their camp and immediately removed booties, spread straw and began heating water for the canine’s gourmet meal. After dinner, the mushers spent time with their dogs tending to feet and massaging triceps and shoulders. While the dogs sleep on thick beds of straw, their mushers will enjoy the campfire and perhaps catch some sleep themselves. Based on run times coming out to Yentna, I’d estimate the first mushers will arrive at Willow around 2:00 pm on Sunday. If the mushers are bunched as tightly for the return, they’ll all be finished well before the finishers banquet commences at 6:00 pm. 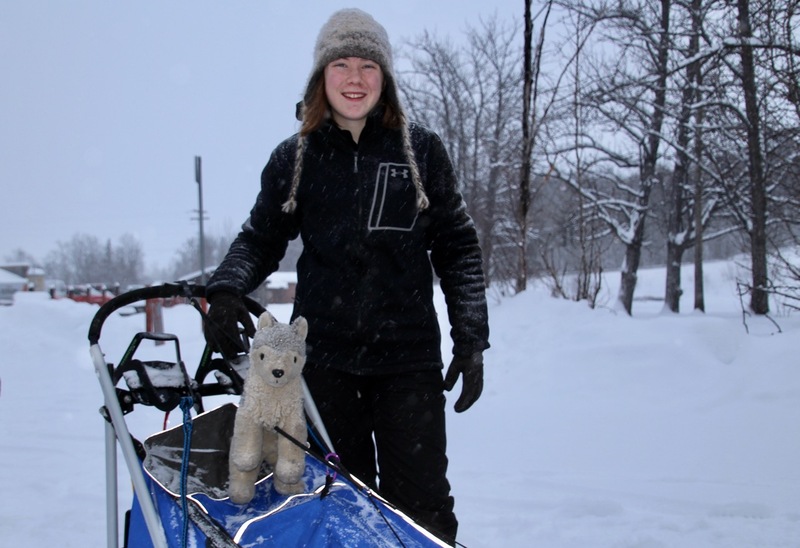 At the start this morning, Lara Renner had a well-worn stuffed Siberian Husky perched atop her sled as she prepared for the race. That husky deserves the credit for Lara’s love for Siberians and her passion for mushing. As a five year old, Lara found the stuffed dog that belonged to her father in the basement. The animal travels with Lara – EVERYWHERE! Perhaps it’s tucked safely in her sled tonight as she camps at Yentna. Race Marshal, Cim Smyth, was very impressed with the mushers and the teams. The mushers are showing excellent dog care while on the trail and at the checkpoint. All of the dog teams look very enthusiastic and strong, Tomorrow will prove to be an interesting day on the way to the finish line.